The green colour represents forests, and yellow is a complementary colour alluding to the rich resources of the region. The cross with fleurs-de-lis has two meanings. It underlines the Christian nature of the community as well as its namesake St. Philémon, the beloved disciple of St. Paul. 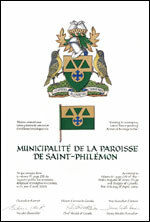 Moreover, its fleurs-de-lis branches indicate that the municipality is located in the province of Quebec. The triangles recall the Allegheny Mountain Range. The buckets represent the maple industry, one of the economic staples of the municipality. 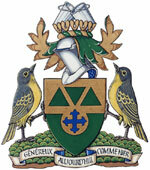 They further allude to the administrative region of Chaudière-Apalaches where the municipality is located. The Cape May warblers are a species of birds found in Quebec. The grassy mound represents the natural setting of the region where Saint-Philémon is located. 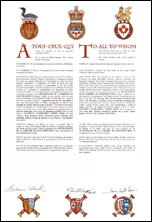 Meaning "As generous today as yesterday", refers to mutual aid within the community and to its sanatorium.